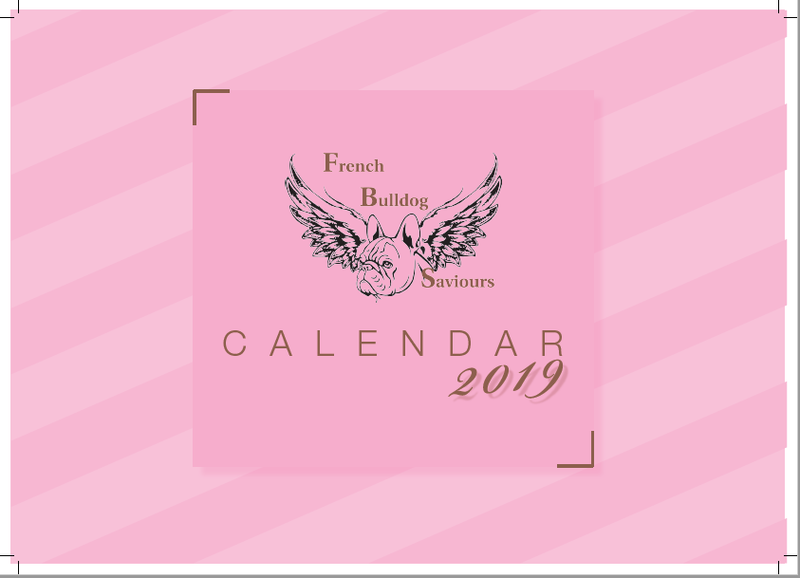 FBS 2019 Calendar and Diary's available to order now! Orders for the 2019 calendar and diary are now open! The diary comes in Pink or Grey with copper foiling wording. The calendar is pink (obviously!) with copper foiling wording. Once you have paid please send Jo Wood a screen shot on facebook to her inbox and you will be added to the order list. ALL PROFITS GO TO FBS! 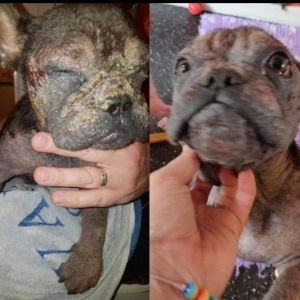 ‘After rescuing Martha I came across fbs and just wanted to help make a difference. And I love dogs 🙈 . ‘I do it for the love of the dogs.. they need a voice, a dog shouldn't be treated any different to any living thing. Humans are disgusting and disguard them like a piece of clothing when they go out of fashion. I educate people where I can if I'm out walking the dogs, at the vets or events. It appears the FBS family have been on their holidays! We love seeing our FBS babies summer fun photos so we thought we would share them with you! 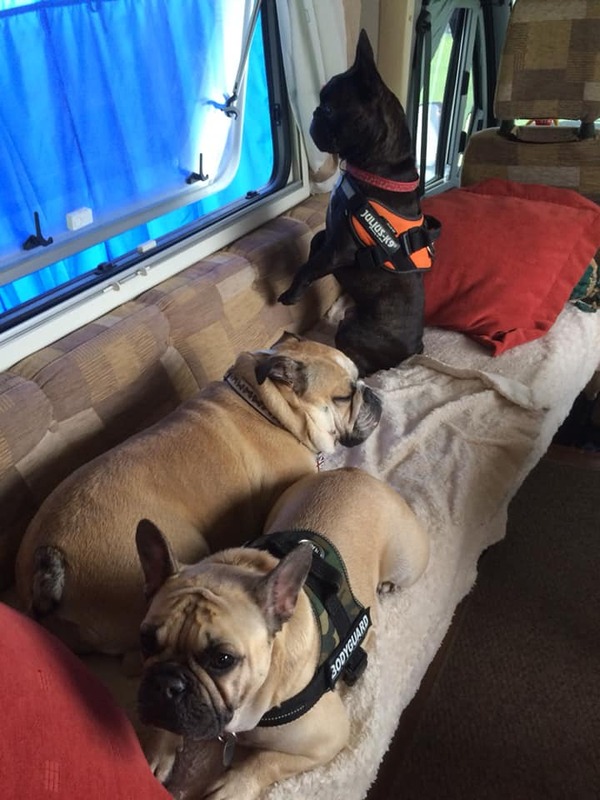 FBS Maggie and Ozzie chilling in their very own caravan….or so they think! FBS Remy enjoying a gin and games in Cornwall…hick! 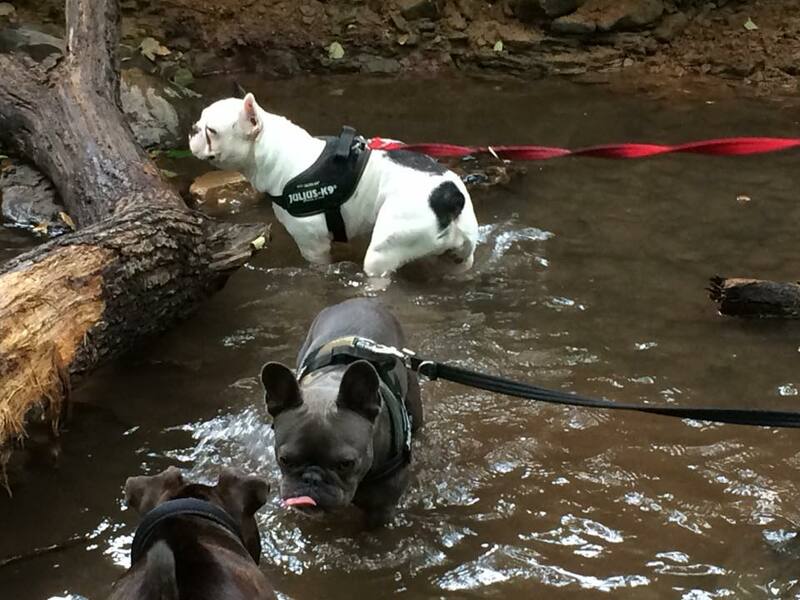 Here at FBS we love a beautiful Frenchie story, especially when it is one of our own rescues. 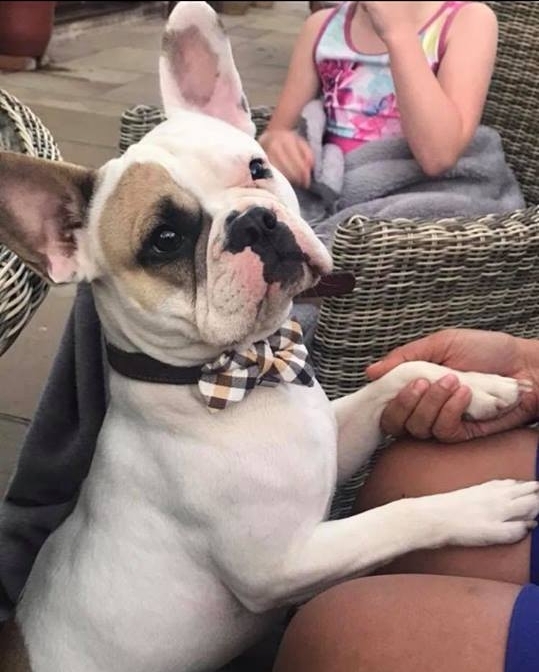 "I had not stopped hearing how much my daughter wanted a French Bulldog for many years, now she was 16 we decided the time was right. We considered buying a puppy as our first dog, however our hearts were broken when we found FBS & saw how many Frenchies needed help. In February this year our perfect furbaby came up for adoption. We spent a long time writing, & re-writing, our application. After a nail-biting few weeks we were contacted by a lovely lady asking if we were available so that she could complete a home visit. We were so excited that she dragged herself out in the snow & spent a few hours asking us all the questions she needed to. What a lovely thing to do, I couldnt thank her enough! We were ecstatic when a short time later when we were told we had been picked to be Zee’s (FBS Elkies) forever home. In the heavy snow in March this year we drove from Kent to Leeds to pick up our first ever furbaby. Zee is 6 years old & very anxious, causing her to be reactive to other dogs. We live in a small village, surrounded in countryside, so we are lucky enough to be able walk her miles away from other people & feel confident enough to allow her to run around off-lead. Last week, as the weather was cooling off, we managed a rare mid afternoon walk through fields. We were a mile & a half away from any house when Zee went running ahead and seemed very interested in something on the ground, getting closer I could see it was a tortoise!! Zee was very pleased with herself & as I desperately tried to carry the wriggling tortoise the mile & a half back, Zee smiled & bounced around wanting to play with it! I should explain that Zee doesn’t have many animal friends, because of her anxiety, but her best friend at home is a tortoise! A man in his car actually stopped us as we got near home to ask if we were actually taking our tortoise for a walk!! Once home I wondered how on earth I was going to find the owner when it was found so far from anywhere. I started by putting a ‘Found’ post on our village Facebook page. I was contacted several hours later by a couple desperately upset because there tortoise had been missing for 4 days. They explained that their house backed on to the fields. I felt mean when I asked if they had anything that could identify it as theres. I had already been contacted by others & was adamant that I was going to get it back home. As I discussed this with the very understanding couple a few things fell into place. I felt silly asking if they happened to carry out home visits for dog charities but they did! It was the lovely lady who had completed ours!!! They came straight around & were so pleased to be reunited with their tortoise. I was so chuffed to be able to repay them for trudging out in the snow to help us adopt our beautiful Zee." If this story doesn't cheer you up on a Tuesday morning I am not sure what will! FBS does BBC Countryfile Live! This year the team had the pleasure of representing FBS at BBC Countryfile Live. Looking at the weather forecast we was not sure how successful the weekend would be, for once we weren’t worried about rain but the rising heat over the last few weeks. The FBS team packed up their cars/vans with all the merchandise and drove from all over the country to give up their free time to represent the wonderful FBS. On the Wednesday evening the pink tents were erected, and all the stalls set out perfectly ready for Thursdays opening day. With temperatures not dropping we warned visitors to put their dog’s health first and to look for the BIG PINK TENT as we were well equipped to keep all dogs cool! All weekend our doggie paddling pool and dunk pool were in constant use with lovely dog owners enjoying watching their pooches splash about. We had some reluctant dogs (normally frenchies!) that would not even look at the water, but do not worry this is were team FBS came to the rescue with cool towels and gentle hands. The whole weekend team FBS worked hard promoting the charity and educating the public on our motto #breedforhealthnotwealth. With temperatures of around 30 degrees and long 10 hour days the team powered through still smiling and laughing right to the end. The day did not end at site, as the team then went back to their accommodation for the weekend to brainstorm about the future of FBS. People often wonder why we do so many events and for us this year BBC Countryfile Live was a first and it will not be our last! A BIG thank you to all the team who attended and made the weekend what it was! BUT how could we forget our wonderful FBS fur babies who kept us entertained all weekend. Remy, Howard, Peggy, Betty-Boo and our very own Looby! A huge thank you to Pete Wicks for not only spending the first day with us crazy lot but also returning on Sunday for more FBS madness. Events are a wonderful place to meet the team and get involved in FBS – if you would like to get involved please message us on facebook and look out for events near you! FBS: Hey Claire, tell us about your first Frenchie and what it was like to welcome one into your family? Claire : My first frenchie was a handsome fawn with a black mask. As a puppy he had massive ears and I told everyone it was fine, one day he would grow into them. I got him as a pup at 8 weeks from a breeder in Essex, he was the last boy in the litter, but for me it was love at first sight and I knew we would make a great pair. FBS: What made you want a French Bulldog over another breed? 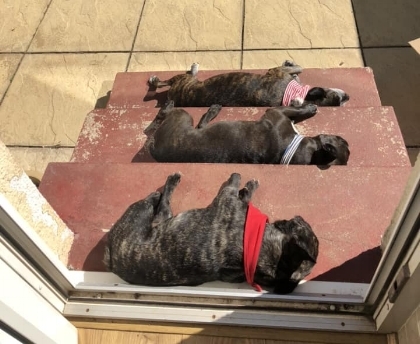 Claire: I had wanted a French bulldog for a few years before Chilli came into my life. I had seen a few around and fallen for their cute face, big ears and unique personality. FBS: Did you do any research before buying? Claire: Before I found my perfect fur baby I did a lot of research into the breed and breeders around my area. 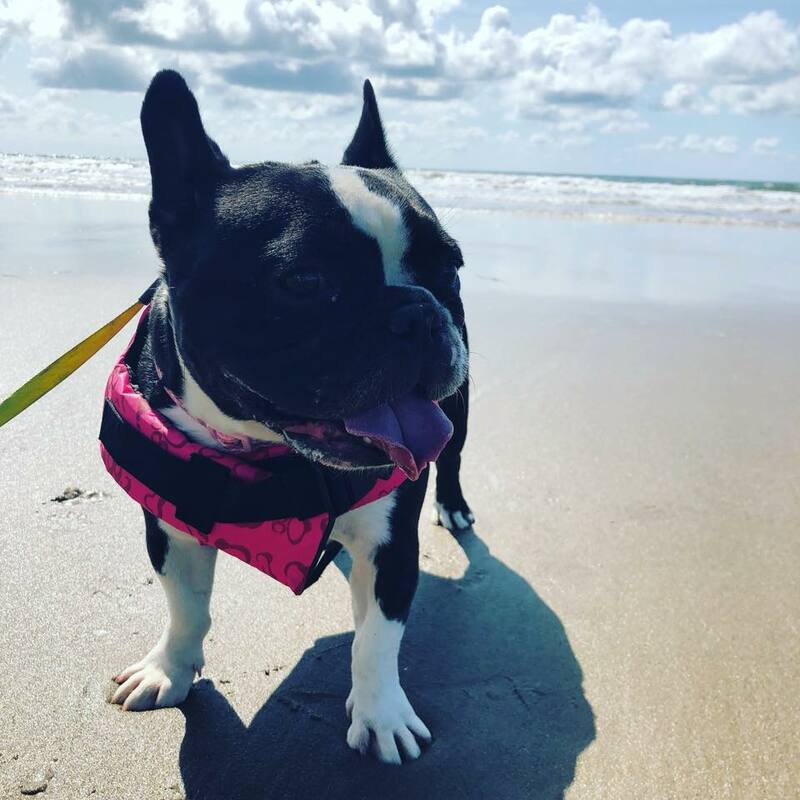 I did a lot of online research mainly looking into the breed as I was aware of the health risks that came with frenchies and I started looking at all the insurance types. I really wanted to do everything by the book so I’d have a healthy pup and be able to give him/her a happy and healthy life. FBS: If you don’t mind me asking how did you lose Chilli and at such an early age? Claire: I had the best year of my life with Chilli before he had his first seizure, that was when our world was turned upside down. He was diagnosed with idiopathic epilepsy and so our journey began. We started off on two pills a day (epilephen) this controlled the seizures for around 3 weeks and then the monster struck again. I couldn’t put into words just how heartbreaking and completely helpless I felt. Chilli suffered cluster seizures and had between 7-12 in an evening and the only way to get him round was to have IV diazepam from the vets. As the months went on we introduced emergency medication (keppra) and also rectal diazepam to try and help bring him round when the seizures happened at home. We then introduced another medication (potassium bromide) this worried me a lot as it can effect the liver so it meant more regular blood tests. Unfortunately being on all these meds we still couldn’t control his seizures and his last cluster was the worst he had ever had. The final trip to the vets is a day I will never forget, when I had to say goodbye to my baby boy. He was taken too young. FBS: Do you think Chilli’s illness may have had anything to do with the breed or the breeders? Have you since looked into this? 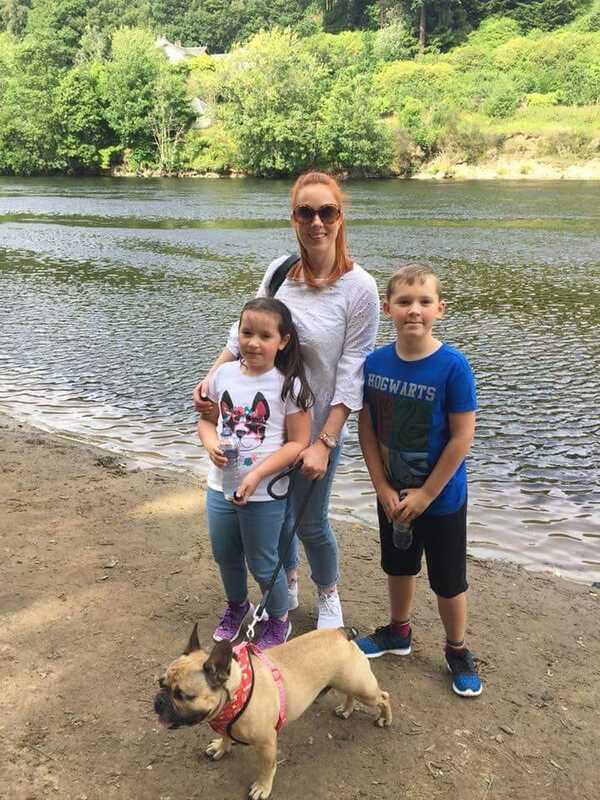 Claire: When Chilli was diagnosed with idiopathic epilepsy I spent every minute, hour, day and night looking into the reasons. Had I done something? Was it the breeder? Idiopathic epilepsy can affect any breed and normally shows effects at around 1 year old. I’ve spoken to a lot of people who were and still are in the same position as me and I really don’t think it’s down to the breeder, unfortunately I think Chilli was unlucky. I have seen an increase in frenchies with epilepsy, but I couldn’t and wouldn’t want to say it’s anything to do with the breed. It’s an awful disease and I wouldn’t wish anyone to go through it with their dog. FBS: When did you decide it was time to look at getting another fur baby? Claire: After losing Chilli I lost a massive part of me and felt lost, I knew that one day I would want another companion. I wanted to give a pooch that needed a forever home all the love they needed, because I couldn’t help Chilli but I hoped I could help another. FBS: What made you want to rescue? 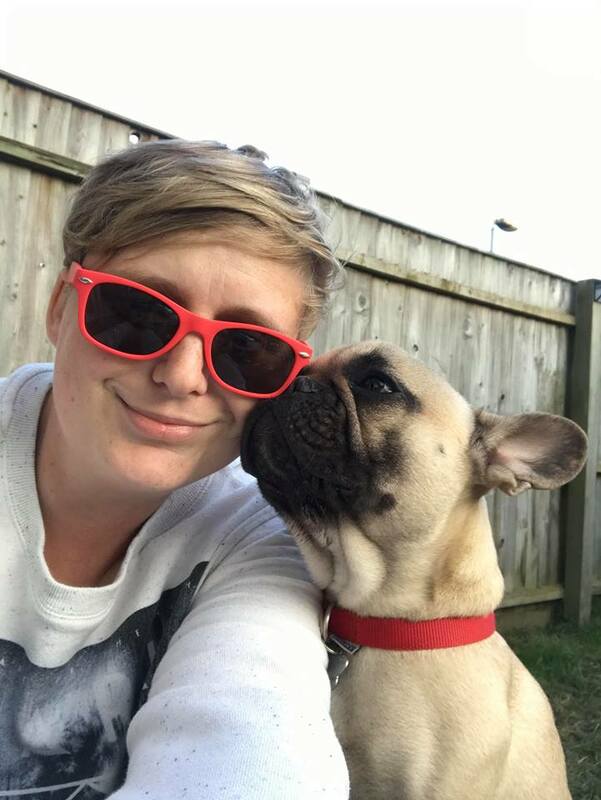 Claire: I found French Bulldog Saviours and admired the amazing work they do for the breed. Originally I wanted to help out with road trains, events and meet the pooches. On the first road train I helped out on (with my partner) we had the pleasure of meeting FBS Martin. He was a handsome little pup that was timid and looked a little lost, but couple of hours we had in the car we fell in love with him - I think it was fate. Now he’s at home in bed with me…taking up most of the room! FBS: What is life like with a rescue? Claire: Life with a rescue at first is strange as they are scared in a new environment, but the reward is watching them grow in confidence, building a bond and becoming best friends. 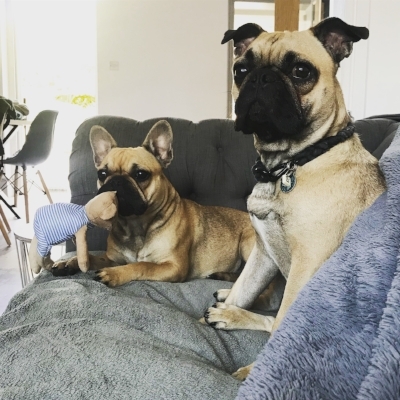 FBS: Do you have any advice for anyone looking to rescue a Frenchie or any other breed? Claire: Frenchie’s make the best companions - they are loyal, funny, cute and lovable. There is the flip side and that is the health problems they can encounter from breathing to spinal issues to allergies and the list could go on... My main advice if you really want a puppy would be look into the breed, research and research some more. Take the time to find a good reputable breeder and always meet both parents! The best route of all is rescuing. Give a pooch another chance in life and they will reward you with all the love you could imagine! Note from FBS Jo: I met Claire and her partner on the roadtrain where their love story with FBS Martin began. I have never seen such a strong bond so instantly. The Martin I knew was quiet and nervous – to see him grow in confidence and become the cheeky chap he is fills me with such pride for his new owners. Our FBS DREAM TEAM have been volunteering at Glasgow Pride this weekend! Amazing effort from all the team traveling miles and miles to support FBS. who remembers this little bean who came to Fbs at just 2 days old? well here he is post op. Whilst you maybe thinking "WOW he looks awesome" or "He looks huge, He's grown loads" ( which he has, he has made amazing progress) this little man is going to have to go for a second bout of surgery. Unfortunately his 1st round of surgery has not been 100% successful and unfortunately is going to have to go under the knife again to try and repair his palate! At such a young age he has been through so much, but he is a real fighter! Without your donations treatment for pupsters like Howard would not be possible!! Little Howard is feeling under the weather so has had a visit to the vets. He is fighting an infection and has had to stay in for further investigation. He had his palate repaired over 6 weeks ago, unfortunately it hasn't worked and he will require further surgery. This can not take place until he is feeling well and recovered from this set back. 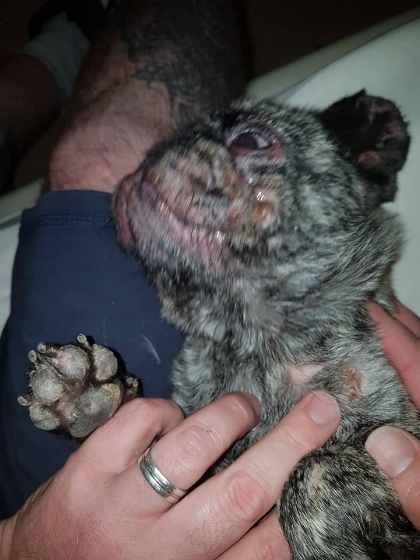 As you can see by the pictures his poor foster Dad (or mum as Howie sees him) is really upset and hoping he is soon feeling better. We will update you again later when he is collected from the vets, but for now keep this little man in your thoughts. Michelle and Sharon raised over £900 for French Bulldog Saviours. Girls - we can't tell you how amazing you are and how thankful team FBS and the pooches are! 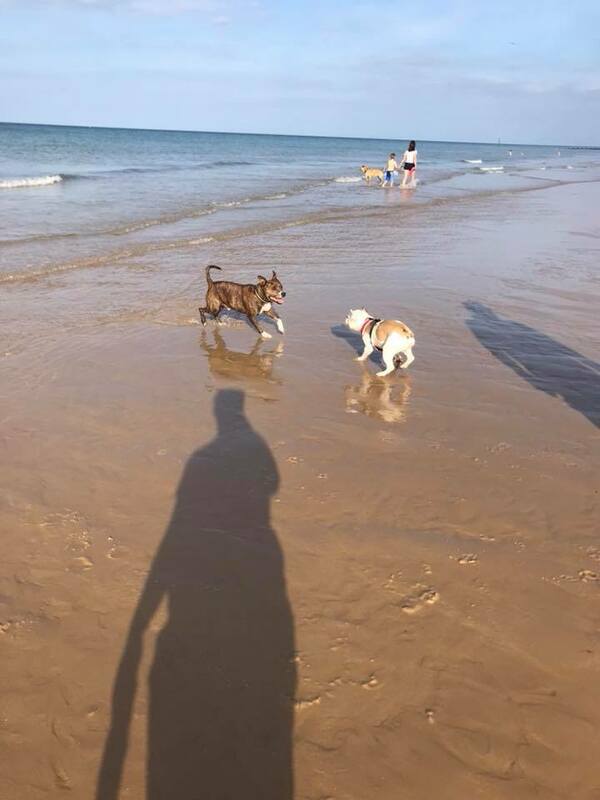 DOTTY- My foster Momma has taken me on holiday this week, she said I need a break after being so poorly. I feel amazing now and she said you would never think I had been so, so poorly. It's been really warm so I've been dipping my toes at the beach! such a lucky girl!! TEDDY- hey guys, I know I touched everyone's hearts with my story about my very poorly back legs- do you know what, I've got this guys. My foster family are amazing and adore me more than anything! As you can see In totally rocking my Buggy. Means I can get out and about in this heat and meet my fans without struggling about on my wheels!! I popped along to an FBS event today to say hi to all!! HEY everyone, as you heard already this week I'm feeling much better already! Enjoying lots of snuggles and cuddles!! HEY, well I've been to an event today too, there were lots of dogs about to shout at! everyone who passed me needed to love me. I loved it!!! My foster sister's kept me nice and cool in the Paddling pool! can't say it's my favourite thing, going into a cold pool. I much prefer my warm baths and pamper sessions!! Not my best photo. it was taken just after a cool down! So, my foster Mummy has bought me a cooling jacket and I love it, keeps me cool as a cucumber. My hydro is going really well. I feel so lucky to have a foster mum who can help me build strength by swimming! who knew exercise could be such fun!!! Good morning followers, my foster people said its was time to pop in and say hello again! I would like to say a MASSIVE thankyou for all my little presents that have been sent from you all. I feel very lucky having so many people who love me without even meeting me! I am still on tablets, the vet man said I needed another 2 week course to help me on my way. The slaves are still bathing me every day to help soothe my itchy skin, which by the way is getting less itchy by the day! Big thank you to our amazing volunteers who represented and raised money for us this weekend at the festival of leisure! MORNING fans look how much HAPPIER I'm feeling now all my skin is drying up! Fbs have made a wish list on amazon for products to help sooth my skin please take a look. This is a post though wondering if anyone has any old Doggy or small person T-shirts they could donate to help me?! I am only 5.9kg so please bare that in mind!! The new and improved FBS website is now live. This platform will be your go to for everything FBS. We hope you like the changes as much as we do.